Before birth, the two major arteries—the aorta and the pulmonary artery—are connected by a blood vessel called the ductus arteriosus. This vessel is an essential part of fetal blood circulation. Go to the "How the Heart Works" section of this article for more details about how a normal heart works compared with a heart that has PDA. PDA is a type of congenital heart defect. A congenital heart defect is any type of heart problem that's present at birth. If your baby has a PDA but an otherwise normal heart, the PDA may shrink and go away. However, some children need treatment to close their PDAs. Some children who have PDAs are given medicine to keep the ductus arteriosus open. For example, this may be done if a child is born with another heart defect that decreases blood flow to the lungs or the rest of the body. Keeping the PDA open helps maintain blood flow and oxygen levels until doctors can do surgery to correct the other heart defect. PDA is a fairly common congenital heart defect in the United States. Although the condition can affect full-term infants, it's more common in premature infants. On average, PDA occurs in about 8 out of every 1,000 premature babies, compared with 2 out of every 1,000 full-term babies. Premature babies also are more vulnerable to the effects of PDA. Doctors treat the condition with medicines, catheter-based procedures, and surgery. Most children who have PDAs live healthy, normal lives after treatment. Figure A shows the location of the heart in the body. Figure B shows a cross-section of a healthy heart and its inside structures. 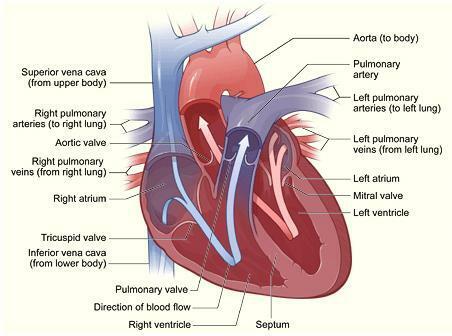 The blue arrow shows the direction in which oxygen-poor blood flows through the heart to the lungs. The red arrow shows the direction in which oxygen-rich blood flows from the lungs into the heart and then out to the body. The atria are the two upper chambers that collect blood as it flows into the heart. The ventricles are the two lower chambers that pump blood out of the heart to the lungs or other parts of the body. The tricuspid valve is in the right side of the heart, between the right atrium and the right ventricle. The pulmonary valve is in the right side of the heart, between the right ventricle and the entrance to the pulmonary artery. This artery carries blood from the heart to the lungs. The mitral valve is in the left side of the heart, between the left atrium and the left ventricle. The aortic valve is in the left side of the heart, between the left ventricle and the entrance to the aorta. This artery carries blood from the heart to the body. The first sound—the "lub"—is made by the mitral and tricuspid valves closing at the beginning of systole. Systole is when the ventricles contract, or squeeze, and pump blood out of the heart. The second sound—the "DUB"—is made by the aortic and pulmonary valves closing at the beginning of diastole. Diastole is when the ventricles relax and fill with blood pumped into them by the atria. For more information about how a healthy heart works, go to the Health Topics How the Heart Works article. The article contains animations that show how your heart pumps blood and how your heart's electrical system works. The ductus arteriosus is a blood vessel that connects the aorta and pulmonary artery in unborn babies. This vessel allows blood to be pumped from the right side of the heart into the aorta, without stopping at the lungs for oxygen. After birth, the baby no longer is connected to the mother's bloodstream. Thus, the baby's blood must travel to his or her own lungs to get oxygen. As the baby begins to breathe on his or her own, the pulmonary artery opens to allow blood into the lungs. Normally, the ductus arteriosus closes because the infant no longer needs it. Once the ductus arteriosus closes, blood leaving the right side of the heart no longer goes into the aorta. Instead, the blood travels through the pulmonary artery to the lungs. There, the blood picks up oxygen. The oxygen-rich blood returns to the left side of the heart and is pumped to the rest of the body. 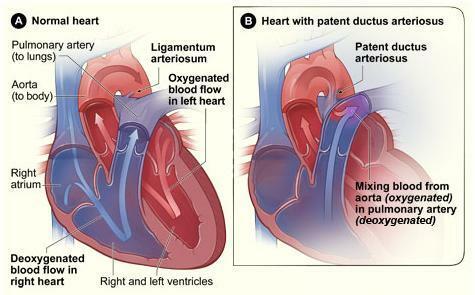 Sometimes the ductus arteriosus remains open (patent) after birth. A PDA allows blood to flow from the aorta into the pulmonary artery and to the lungs. The extra blood flowing into the lungs strains the heart. It also increases blood pressure in the lung's arteries. Full-term infants. A small PDA might not cause any problems, but a large PDA likely will cause problems. The larger the PDA, the greater the amount of extra blood that passes through the lungs. A PDA can slightly increase the risk of infective endocarditis (IE). IE is an infection of the inner lining of the heart chambers and valves. In PDA, increased blood flow can irritate the lining of the pulmonary artery, where the ductus arteriosus connects. This irritation makes it easier for bacteria in the bloodstream to collect and grow, which can lead to IE. Premature infants. PDA can be more serious in premature infants than in full-term infants. Premature babies are more likely to have lung damage from the extra blood flowing from the PDA into the lungs. These infants may need to be put on ventilators. Ventilators are machines that support breathing. Increased blood flow through the lungs also can reduce blood flow to the rest of the body. This can damage other organs, especially the intestines and kidneys. Echocardiography (echo) is a painless test that uses sound waves to create a moving picture of your baby's heart. During echo, the sound waves bounce off your child’s heart. A computer converts the sound waves into pictures of the heart’s structures. Patent ductus arteriosus (PDA) is treated with medicines, catheter-based procedures, and surgery. The goal of treatment is to close the PDA. Closure will help prevent complications and reverse the effects of increased blood volume. Small PDAs often close without treatment. For full-term infants, treatment is needed if the PDA is large or causing health problems. For premature infants, treatment is needed if the PDA is causing breathing problems or heart problems. Talk with your child's doctor about treatment options and how your family prefers to handle treatment decisions. Indomethacin (in-doh-METH-ah-sin) is a medicine that helps close PDAs in premature infants. This medicine triggers the PDA to constrict or tighten, which closes the opening. Indomethacin usually doesn't work in full-term infants. Ibuprofen also is used to close PDAs in premature infants. This medicine is similar to indomethacin. Catheters are thin, flexible tubes that doctors use as part of a procedure called cardiac catheterization. Catheter-based procedures often are used to close PDAs in infants or children who are large enough to have the procedure. Your child's doctor may refer to the procedure as "transcatheter device closure." The procedure sometimes is used for small PDAs to prevent the risk of infective endocarditis (IE). IE is an infection of the inner lining of the heart chambers and valves. Your child will be given medicine to help him or her relax or sleep during the procedure. The doctor will insert a catheter in a large blood vessel in the groin (upper thigh). He or she will then guide the catheter to your child's heart. A small metal coil or other blocking device is passed through the catheter and placed in the PDA. This device blocks blood flow through the vessel. Catheter-based procedures don't require the child's chest to be opened. They also allow the child to recover quickly. These procedures often are done on an outpatient basis. You'll most likely be able to take your child home the same day the procedure is done. Often, surgery isn't done until after 6 months of age in infants who don't have health problems from their PDAs. Doctors sometimes do surgery on small PDAs to prevent the risk of IE. For the surgery, your child will be given medicine so that he or she will sleep and not feel any pain. The surgeon will make a small incision (cut) between your child's ribs to reach the PDA. He or she will close the PDA using stitches or clips. After surgery, your child will spend a few days in the hospital. He or she will be given medicine to reduce pain and anxiety. Most children go home 2 days after surgery. Premature infants usually have to stay in the hospital longer because of their other health issues. When your child goes home after surgery, you can expect that he or she will feel fairly comfortable. However, you child may have some short-term pain.